Metal paint trays, plastic paint trays, painting trays, tray liners. Strainers and grids are available on the Paint strainers page. Sturdy metal trays. Ribbed bottoms and rounded corners for easy cleaning. 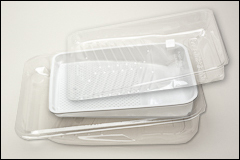 Tray liners are listed below for these 11" trays. Sold by the box. 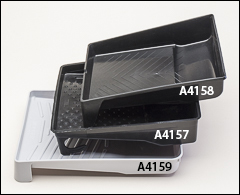 A4158 is an injection molded tray and is the least expensive plastic tray. A4157 is a 2 quart solvent-resistant polypropylene tray with ladder hook legs. A4159 is a 1 quart solvent-resistant, copolymer polypropylene. 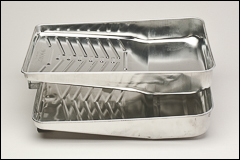 All trays have molded rib design in the roll-off area for even loading. Sold by the box. WARNING: Proposition 65 Label for A4158 . Form-fitting liners for four of the six trays listed above. Solvent-resistant PET resists cracking. A4152 is white. Sold by the box. WARNING: Proposition 65 Label for A4152 . 1 gallon capacity deep well. 20" wide plastic tray for use with 18" wide rollers. Sold by the box, 12/box. WARNING: Proposition 65 Label for A4167 . capacity deep well. 21" wide solvent-resistant plastic tray for use with 18" wide rollers. Sold by the box, 6/box. capacity Wide Boy one-piece polypropylene bucket resists solvents and paint build-up. Built-in roll-off area for 18" rollers. No-tip design. 5/16" handle. 14" x 24" x 10" high. Sold by the box, 3/box.